When, in the year 2050, the US customary system of measurements finds itself in its last throes of life, having been barged cruelly to the wayside by the practical realities of trade barriers between America and her now virile, dominant and metricated cousin - China, not to mention the rest of the world; when, like in modern-day Britain, customary measures are used only informally by the elderly, and enjoy little if any legislative protection; when all seems lost for this by now decrepit, creaking, elderly system; it may be the perfect time to perform a little Frankensteinian magic, and transform the ailing imperial system into a standardised, hexadecimalised, metric-aligned super-beast. The crux of the proposed reform exploits a handful of delightful numerical coincidences: Firstly, that there are 63360 inches in a mile. In hexadecimal, this number is F780: only eight-hundred-and-seventy-fim less than hexadecimal 10000 (decimal 65536). Secondly, 1/16th of a (or in hexadecimal, 0.1) mile happens to be 100.584 metres - almost exactly one hectometre. By re-defining the mile as being exactly 1600 metres, and by defining there to be (hex) 10000 inches to the mile, this bedraggled old system could gain a new lease on life; allowing it to coexist peacefully with its French base-ten counterpart and could even, by virtue of its mathematical, binary purity, come to be the preferred system of scientists, engineers, merchants and laymen the world over. 16 inches to the cubit. 16 cubits to the lug. 16 lugs to the block. 16 blocks to the mile. One block is exactly 100m; which is the new, rounded pivotal point between metric and neo-imperial. The inch would suffer a small loss of 3.4% its length; the mile a mere 0.6%; but as metric would in the year 2050 no doubt be dominant in all but informal communication, it is unlikely anyone would notice. And of course, this reform would mean all imperial penises would become 3.4% larger, winning popular approval. It seems to me that such a reform will be the last chance for the cultural relic of customary measures to avoid its otherwise inevitable death, and would also be the perfect opportunity for hexadecimal supremacists to begin their rise to numeral dominance. I know what you mean and i have friends who would agree, and i see the merits but i disagree. However, i really like it. I also see lots of plumbing leaks and loose screws happening. Have you thought about other scales such as mass, time and electrical stuff? I almost posted an idea on a Martian system of units here a while ago. I haven't bothered defining any volumetric or mass units, as they would almost certainly bear no resemblance to customary units or avoirdupois. 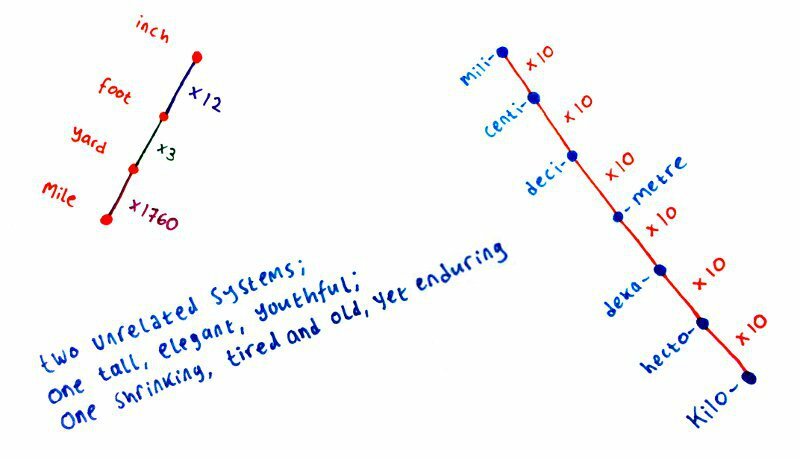 I would most likely follow the examples set by the metric system in how the units relate to one another, e.g. 1 cubic something = 1 something volume = 1 something mass of water. An alternative approach to hexadecimalisation would be simply do away with the imperial system and just invent some hexadecimal prefixes meaning the hex equivalent of mili- and kilo- etc. E.g. 1 deximetre = 1/16th metre and 1 hexametre = 16 metres and so on. This would have the advantage of the metre remaining the universal unit, but there would be no way for inches or miles to slot into such a system. I'll link to my thoughts about the Martian system in a sec - it's on my blog rather than here. If i remember correctly i found there were enough coincidences for the volume and weight units (not masses because i wanted to emphasise the gravitational differences) to fit into meaningful familiar units. The Martian "nautical mile", for example, is only a dozen and four SI metres short of a kilometre. If you extend your system, i haven't checked but i think you'll find there are other coincidences which will make it easier to compare than you might expect. My weight unit was based on dry ice rather than water, incidentally. Water's not the only choice. Well, you'll see if you look. People tend to use the word "dozenal" for duodecimal, i think because the term "duo-decimal" is a concession to decimal whereas using "dozen-" is more opaquely linked to twelve. Though you wouldn't have gone over to using "round" numbers for conversions (that is, numbers that are a digit followed by one or more zeros, so you can just move the decimal around). I mean, sure, if you stick with the modified imperial you can multiply or divide by A0 or A000 or whatever. Just move the decimal place. But then doing Metric to metric conversions would have non-"round" numbers, for example 100 in hex is 64, and 1000 is 6E8. Ditto with cross-conversions between metric and your new imperial. This also got me to thinking, how would you pronounce hex numbers? So here's what I got, you can just say the letters A, B , C, etc. Hundreds and thousands, millions etc work the same, just that sometimes you might have a letter prefix, so, A00 would be "Ay-hundred" B00 would be "Bee-hundred" and so on though that might lend confusion with "one hundred" and "two hundred" and so on. So maybe we could change "hundred" into "gundred" and "thousand" into "flousand"
I just read out the characters myself. Seems to work fine. It even works with decimal. When we pronounce numerals, we often do it arse-about-face. Nineteen has the second digit first, some people say "one and twenty" and then there are dates, such as "nineteen seventeen" which by rights should have the second and fourth digits as the first and third. I've never even really bought into the superiority of the metric system anyway. It has a number of disadvantages. It's much easier to make mistakes because of all the easy decimal moving. People have died from this, and even once space equipment was lost. Not to mention studs and stud spacing. What the hell are you gonna call a 2 x 4, a 51 x 102? Mush mouth. And what about 16" on center? Convert that and again, mush mouth. OMG you guys actually still say that over there? HA! That is great. We only know that saying from the song ("four and twenty blackbirds, baked in a pie"). The more stuff I see and wacth the more I notice you limeys are actually like your stereotypes. Well, i say "still". My grandmother, from a southwestern family born a century back, definitely said "seven and forty" or whatever that way round. At the time, there were still people in Somerset who said "ich" for "I". I couldn't swear to having heard it in recent years and i expect it's died a death, which is very sad if true. [idris83], perchance are you [unabubba] ? There's a little ambiguity there with 80 and A0, 18 and 1A. I think it would be better not to use alphanumeric digits at all but we're probably stuck with 0-9 A-F now. In which case, some dude from Internet has already come up with the goods on this one: Nine, ten, eleven, twelve, draze, eptwin, fim, tex. Hundrek, thousek, millek. I'll post a link to his ideas. With his system, DEADBEEF might be pronounced: Draze thousek, eptwin hundrek and tentek-draze millek, eleven thousek, eptwin hundrek and eptek-fim. 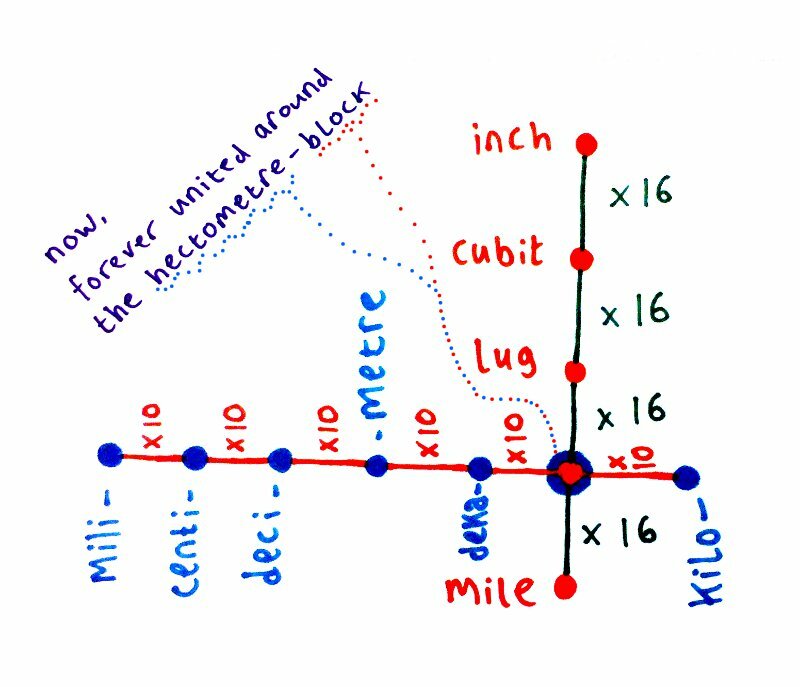 I kind of have to agree with you here: recent adopters of the metric system such as Australia and the UK have to use the revised SI version of the metric system, which only allows fiddly/cumbersome 10^3 prefixes such as mili and kilo, which aren't as convenient as the far more "human" 10^1 and 10^2 prefixes they get to use in traditional metric countries in continental Europe. I have no idea what the rationale was for ditching centi, deci, deka and hecto. There's a good half-bake entitled "Shorter metric words" which is worth a look. The UK has centimeters, decibels, decathlons and hectares. And double-dekabuses. close but not identical competing units are probably a bad idea. People will mix them up. Look at the confusion over hard-disk sizes. Base 16 also has the benefit of fitting well into a standard musical 4-bar progression. Musical/mathematical harmony at last! Do you mean besides growing improperly shaped cylindrical onions, making impronounceable sauces, and driving on the wrong side of the road? //impronounceable// a useful coinage, describing words that are easy to pronounce, but whose pronunciation is hard to infer from their spelling (like Worcestershire). And that's it, as far as I'm aware. In terms of sauces, those are the only ones anyone ever needs to know. Yes there's Worschestershire Sauce, but that's just watered down HP. Also, the cylindrical onions are entirely the Welsh's fault - nothing to do with the rest of us. And as for driving on the appropriate side of the road, we've been involved in (and won) countless wars over that issue ever since since Napoleon decided to be "modern" - which takes us back to metric once again. You forgot chocolate sauce, essential on ice-cream. Does Ice-cream count as a sauce? 95% of people are right handed. Therefore, most people (back in the day) would hold their weapon in their right hand. While walking/marching militarily down a road, you would want your weapon to the middle of the road, in case of meeting the enemy/whatever coming the other way. Alternatively, if you meet a friend, you put away your weapon to shake their hand (weapon in right, so shield in left - you hold your shield and put away your weapon to shake; the basis of the 'right hand shake' custom). Ergo, you would walk on the left side of the road. Expand through history to the modern day - drive on the left. There is a similar historical argument for why spiral staircases in castles spiral up clockwise. That's enough of your sauce, RayfordSteele! Personally I think we should just get on with using binary as soon as possible, ready for the day when we all get cyborged up. Whaddaya reckon, that everyone used to go around carrying weapons all the time? I doubt that most people of the more peasantly sort (i.e. nearly everyone back then) even owned weapons, much less carried them in hand wherever they went. Even those who were affluent enough (and had enough worth protecting) to own a sword probably kept it in a scabbard most of the time. Besides, it's driving on the /right/ that has the historical basis. Imagine your common peasant carrying his chickens/geese/cats* or what have you to market. He places them in a sack and swings it over his left shoulder, so his right hand is free to pick his nose and scratch himself with. Now, if he walks on the left side of the road, he's risking having his sack of chickens grabbed out of his hand by a rogue hiding in wait in the bushes, so he walks on the right hand side to leave a margin. So you see, clear historical precedent for driving on the right.